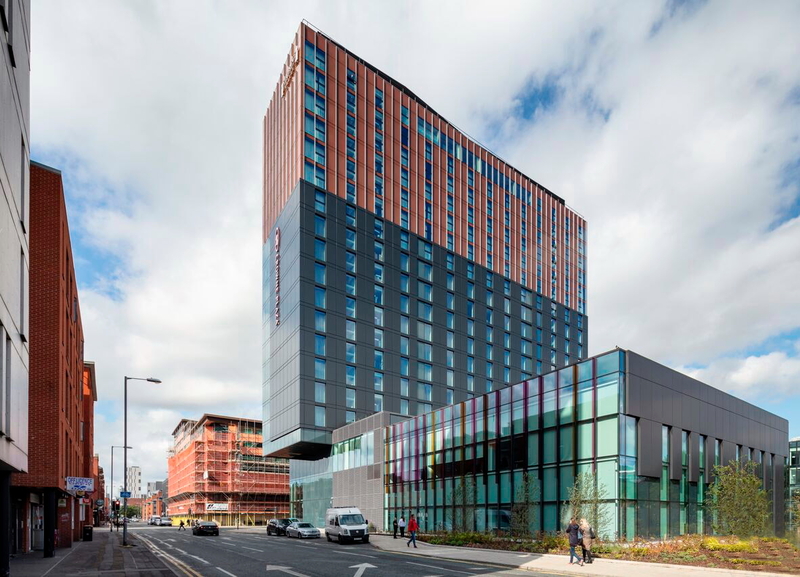 M&L Hospitality, a Singapore-based hotel investment company, has opened a 19-storey hotel development, The Lume, in Manchester, England. Featuring both Crowne Plaza and Staybridge Suites hotel brands, the property officially welcomed its first guests this week. Located in the bustling Oxford Road area, within walking distance of the city centre, the newly completed 328-room hotel development marks M&L Hospitality’s first property in Manchester, bringing its UK portfolio to 5 hotels. Travellers to the north of England will now have a new way to experience Manchester and can choose between two different IHG hotel styles under one roof. Located on the upper seven floors, Staybridge Suites offers a mix of 116 studio and one-bedroom suites featuring fully-equipped kitchens and panoramic views of the city from the terrace on the 18th floor. Occupying the lower 12-storeys, the Crowne Plaza hotel features 212 guest rooms, an 120-seat restaurant, bar, fully equipped 24-hour gym, club lounge and seven meeting rooms catering for over 200 delegates. “Business and leisure travellers are constantly demanding a new hotel experience, with most opting for flexible offerings and well-located hotel experiences. The location of The Lume boasts easy access to transport links and Manchester’s major tourism attractions and commercial hubs. Short and long-stay business clients, leisure visitors, entrepreneurs, academics and those visiting the universities nearby, are all expected to become regular guests of the hotel,” Neil Maxwell, Chief Executive Officer of M&L Hospitality also commented. The dual-branded hotel development forms part of the University of Manchester’s Campus Masterplan, which includes the wider redevelopment of Alliance Manchester Business School. It also adjoins its new two-storey Executive Education Centre, which will provide a new home for the business school’s corporate leadership and management programmes. Further enhancing The Lume’s connection to the city, its meeting rooms are named after famous University of Manchester alumni including Alan Turing, Sir Howard Bernstein and Sir Arthur Stanley Eddington. The opening of The Lume hotel brings M&L Hospitality’s global portfolio to 17 hotels across 7 countries. See latest HD Video Interviews, Podcasts and other news regarding: Manchester, England.